To pull up by the roots. I recently took a great road trip with my two boys. We rented one of the new Kia Soul’s which my boys recognized from a very funny commercial developed to highlight its hipster (hamster?) vibe. The commercial reminded me of the old Hamburger A or Hamburger B commercials from Wendys back in the late 80’s wherein this ludicrous contrast is set up to demarcate the dichotomy between two distinct choices. Understanding the components parts of our modern conception of "Health Insurance" is the our first step toward meaningful reform. 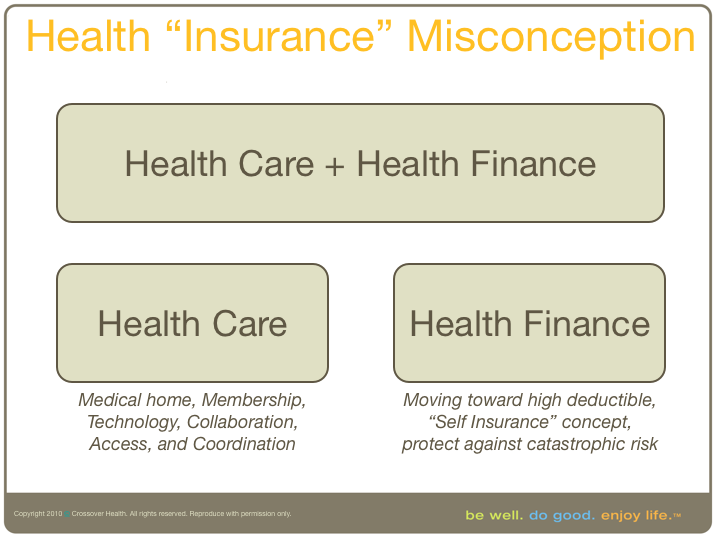 The challenge is that “Health Insurance” is a confused term which most people equate with both Health Care (care delivery) and Health Finance (how you pay for it). Our current employer based system (wherein your employer provides and in most cases pays for your insurance) as well as a third party insurance payment system (we have the insurance pay for us) creates all kinds of weird incentives but also results in no accountability in terms of cost, quality, or outcome. It is currently imploding before our eyes. Our reaction, both opportunistic as well as obligatory, is to do something totally different by blowing up the current Health Insurance model and separating out Health Care from how you pay for it (Health Financing). We say that there is a better way to do BOTH – pay your physician directly for the care you need and then get smart about how you pay for it with the right insurance product. In fact, you should “self insure” with the highest deductible plan you can find and then take responsibility for your health for all the small stuff or hire someone to do that for you (like Crossover Personal Health Advisory Service). There is no reason to intermediate with a parasitic organizations that are taking your premium dollars and wasting it on overhead, fancy offices, mindless phone trees, and my all time favorite “this is not a bill” disinformation pamphlets. As people begin to take this in (they always get how the practice model is a radically improvement), they immediately revert back to the combined “Health Insurance” concept. Does Crossover Health want to replace my current “Health Insurance”? The answer is slightly nuanced, but a resounding YES! I want to replace what you call “Health Insurance” with a direct “Health Care” product (Crossover Health) and a smarter Health Finance product (highest deductible you can get). We believe there are large and significant opportunities to roll this into a single product that can be purchased by employers, families, and other organizations seeking fresh alternatives that can demonstrate not only trend bending improvements but trend busting outcomes. Thanks for information on Health care and health finance. Its always confusing for me when the topic is health insurance.